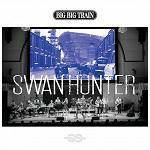 More information: The Swan Hunter EP includes a 2017 live version and a 2018 remix of the studio version of the much-loved song, which originally featured on the English Electric album. The release also includes two previously unreleased tracks: A new version of Seen Better Days which features Tim Bowness on vocals alongside David Longdon, and a live studio recording of Summer’s Lease recorded in Real World in 2017. CD in digipak with 8 page booklet.